With the weather turning colder I though it would be a good time to spice things up a bit with a good ol’ Tex-Mex classic. 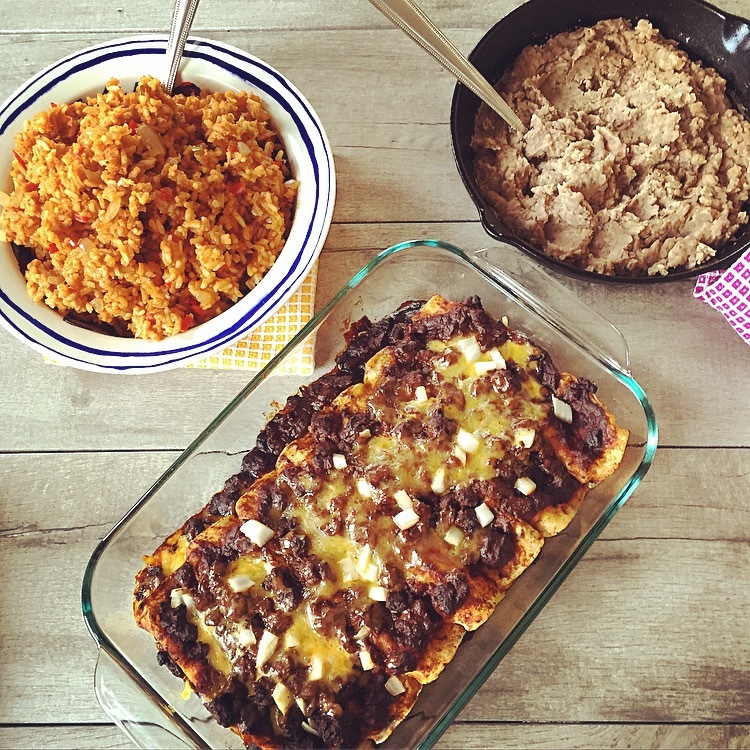 Cheese Enchiladas smoothed in a rich Chili Con Carne Sauce served along side Mexican Rice and Refried Beans. Honestly you don’t get more Texas Blue Plate Special than this. Besides after stuffing ourselves with all the Thanksgiving leftovers for the last week we all are in need of a good Mexican Food fix right? Heat a large skillet (dry) over high heat. 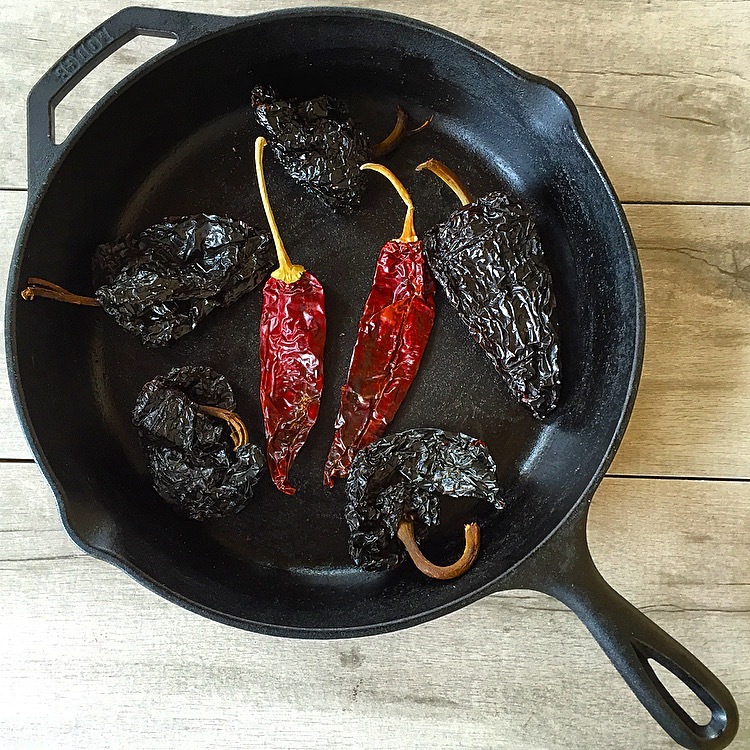 Add the dried chilies to the dry skillet and toast them on each side until puffed and fragrant (10-20 seconds). Then fill the skillet with just enough water to cover the chiles and bring to a boil. Then turn off the heat, cover the skillet, and let the chilies soak for 30 minutes. When the chilis are softened, discard the soaking water, remove the stem and seeds, and rinse the chiles. Place the chiles in a food mill fitted with a course blade* or blender. In a large heavy pot, heat a good drizzle of oil and sauté 1/2 of the chopped onion (reserve the rest of the onion for the enchiladas) until tender. Then add in the minced garlic, cumin, paprika, Mexican oregano, and cayenne pepper (optional) along with salt and pepper to taste. Cook the garlic and spices over low heat for about 30 seconds, until fragrant. Then add the onion, garlic and spice mixture to the food mill or blender with the chiles and puree until smooth. Add another little drizzle of oil to the pot and brown the beef over medium-high heat, breaking it up into small-fine pieces with a wooden spoon. Drain off some of the excess fat then add the beer and scrape up all the brown bits off the bottom of the pan. Stir in the chili puree and beef stock and bring to a boil, then reduce heat cover, and simmer the chili for 30 minutes. After 30 minutes heat 1/3 cup water (or stock) until hot then add the 1/4 cup masa and stir to combine. Then pour the slurry into the chili and simmer for another 15 minutes. 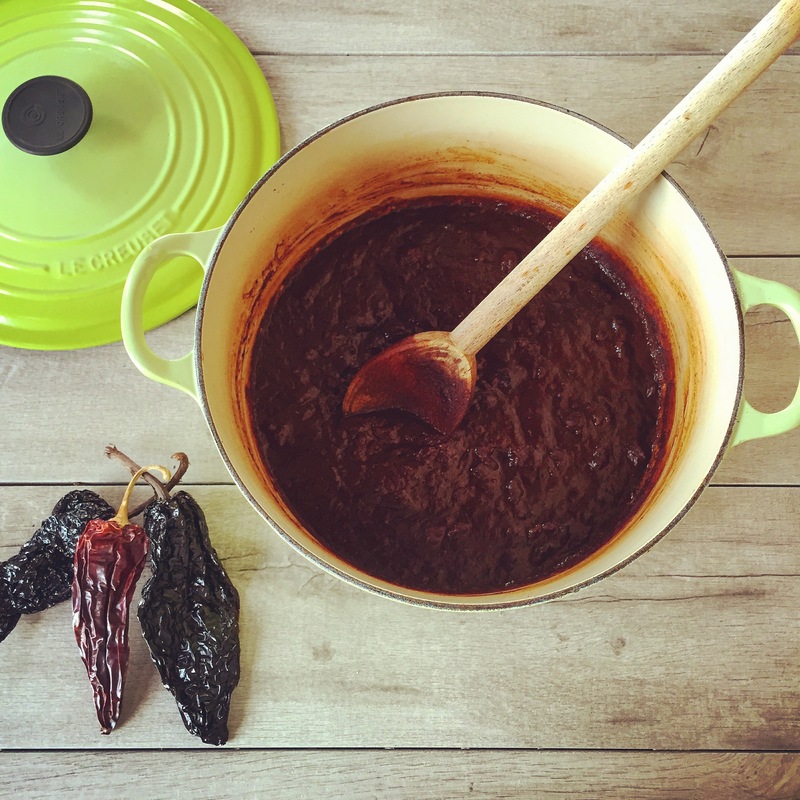 Preheat the oven to 350 and grease a large baking dish Pour 1 cup of the chili con carne into the bottom of the baking dish. Heat desired number of corn tortillas (up to 12) in a skillet or in a tortilla warmer. Step 1: Using a set of tongs dip both sides of a tortilla into the chili (shaking of the excess). Step 2: Place the tortilla on a plate and sprinkle on about 1/4 cup of grated cheddar cheese and a pinch or two of the remaining chopped onion. Step 3: Roll the tortilla and place it in the baking dish. Repeat for desired number of tortillas. Step 4: Pour on just enough of the remaining chili con carne to cover the top of the enchiladas. Top with a little more grated cheese and onion and bake for 15 minutes at 350. 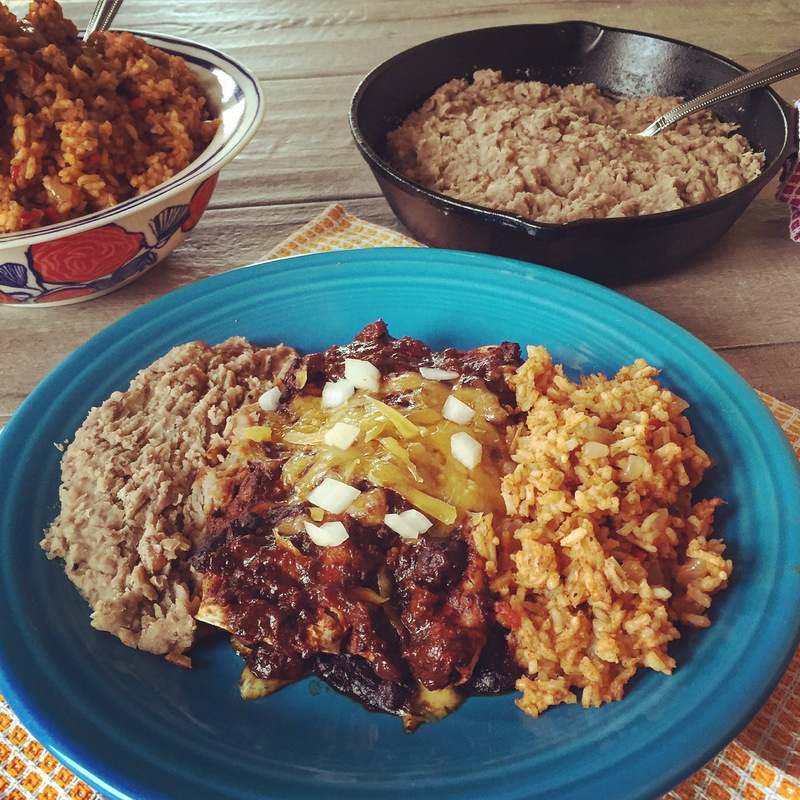 Serve along side Tex-Mex rice and refried beans. I like using a food mill for the chili puree with a course blade but a blender works fine too. For this Chili Con Carne I use a course ground beef, sometimes called chili beef. There are only two people in my household and we don’t always need 12 enchiladas. 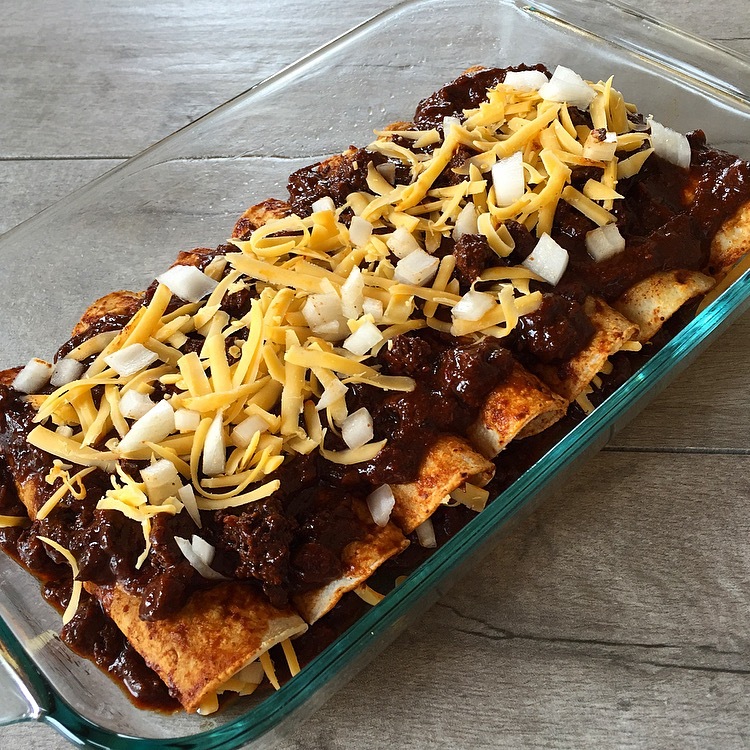 If you don’t need a full dozen enchiladas make a half recipe and freeze the rest of the chili con carne for next time. Looks amazing. I need something spicy on my table this weekend. Must try this. Will also shoot you some suggestions for your time in DC. Thanks Danielle 🙂 spicy food is alway good this time of the year. Looking toward to the suggestions on D.C. too. Monuments – consider one of the ‘night tours’. Eats- consider H Street NE, U Street NW or 8th Street SE for great new restaurants. Holiday Sites -the National Christmas Tree is lovely and National Harbor has a sweet holiday displays plus tons on restaurants. Enjoy your stay. Thanks for the tips Daniella!!! You make the best looking dishes, Melody! Yum! Oh my gosh Mel, I am just drooling! 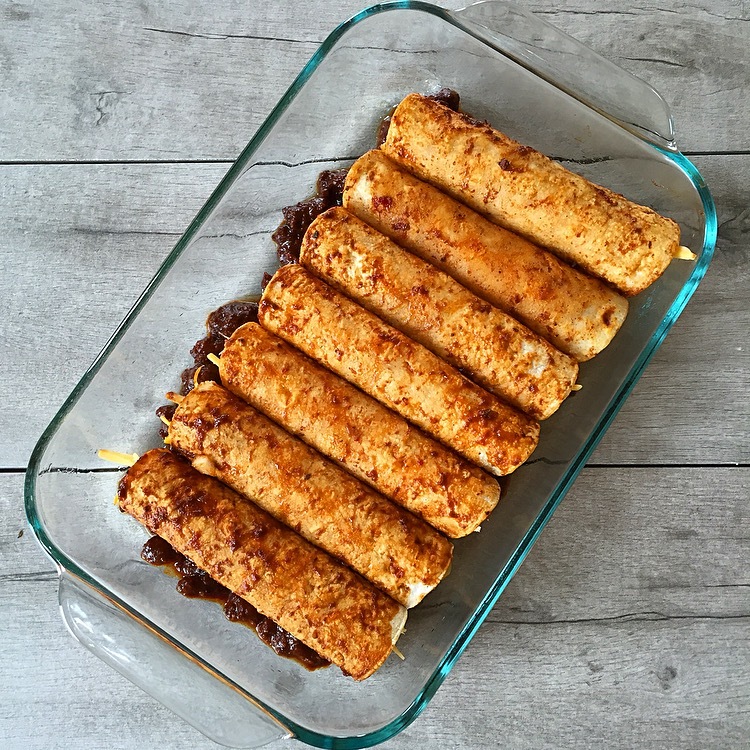 I just love these types of enchiladas, they are TRUE Tex-Mex goodness! Unfortunately I had the flu when we visited DC, and I got to take in most of the sites lying down in the top bunk bed, peering out the tiny RV window as my husband drove by all the memorials. But I do hear the museums are a MUST see! I love some good Tex-Mex Enchiladas this time of the year when the weather gets cold. Yuck it’s never fun to be sick (especially with the flu) on vacation. We did hit up all the moments and several museums. We were walking over 10 miles a day! A Hope you and your parents better!! My mouth is literally watering Mel– these do look so delicious!! 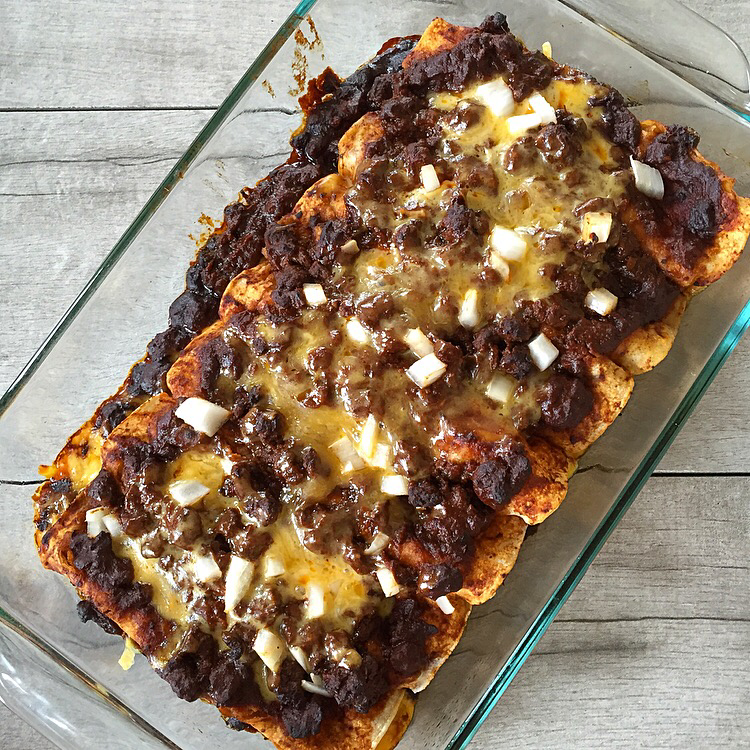 I’ve never heard of an enchilada recipe that included beer! 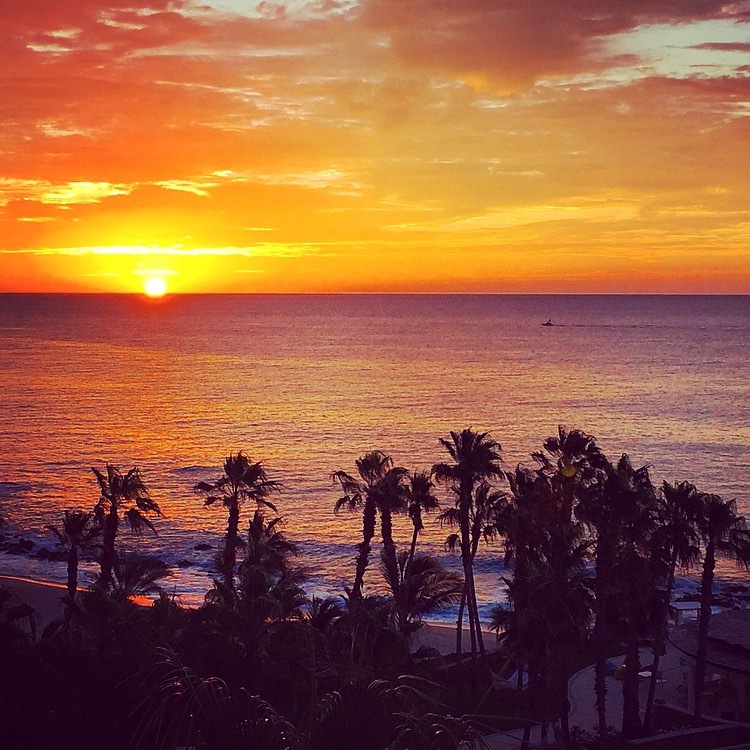 Sounds intriguing– And– I can’t believe you squeeze in a trip to Cabo in the middle of these hectic weeks. I am a bit jealous– it sounds pretty perfect to get away and kick back even for a short trip!! Hope it was the best!! The beer was kinda my own twist I love it in chili so why not in chili con carne 😀. well, it sounds savory and delish!! I’ve never made what looks like Mexican lasagna to me before, but I should! This must be incredibly tasty. That sunrise looks great, too, by the way. Thank Stefan 🙂 Yes you would LOVE enchiladas like these. Hope you are doing well 😀!! Just made this and it was great! Blog post coming up soon… Thanks, Mel, we really enjoyed this. Glad you enjoyed it Stefan it really is a favorite of mine 🙂 Looking forward to the blog post! Happy New Year! !